iCab Mobile is an iPad (and iPhone) web browser app that offers options at your fingertips with settings that can be summoned up any time right there in the browser. 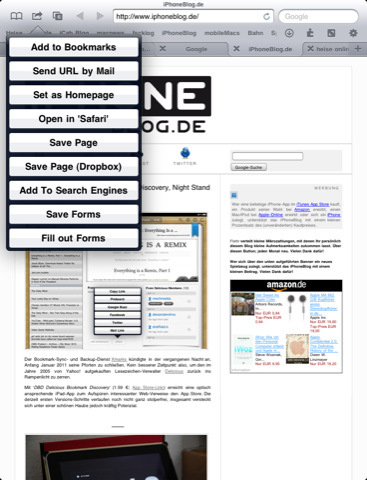 It seems like a silly thing to say, but you can actually set your homepage to be something that you want it to be, and you can return to it by clicking a home button in the address line. Outside of an OS, pretty much everything that I need has some kind of connection to the World Wide Web, as a result a good browser is something that I just can’t do without. I tried to live with Safari, but really it comes up way short of what I would expect of a good browser. Having to go into the iPad’s options to change the settings is also ridiculous I feel, and even then it doesn’t offer much to change. iCab Mobile offers a quick starter that is much like fast dial for Firefox. It has a download manager and you can see a list of downloaded items. Tabs, oh yes, touch and hold gives you options to open the page, open it in a new tab, and my favorite open in a background tab. So if like me you like to open lots of links and have them carry on in the background while you still read the first page, then it is awesome. Safari doesn’t even use tabs, and how cumbersome is it to keep switching pages in Safari…Download page and copy address are available the same way – So simple, but so useful. When you go into the options, it looks more like the options you would expect to see on a PC or Mac desktop browser, and not some severely scaled down mobile device browser. The list of features for this browser is so long that it would be crazy to try and list them all. If you need or want to interact with Facebook, Twitter or even Evernote or Instapaper it is just a simple tap on the puzzle piece and tap your desired option. You want full screen? No problem, you can toggle between them by touching one button, and switch tabs with swipe gestures (and you can customize more gestures) and not forgetting in page searches. For those needing a browser that supports saving forms, and password protection for those forms, iCab Mobile is your answer. You can also secure browser access, and allow for guest access when those around you suddenly need to use your device to browse for something. Like most apps, it does have its problems – It is by no means a pretty looking browser, but really I cant say it looks any worse than any of the others. There have been complaints of crashing in the past, but Alexander Clauss the developer has listened to the feedback from customers, and most of its troubles are a thing of the past. I have as yet not have it crash once. My only real gripe is that when I’m scrolling down a page it seems to stick for just a second before continuing and loading the next part of the page. In my opinion this is a real let down, but even with this problem it is still my browser of choice. No, it doesn’t do flash, but lets face it none of them really do. In short this browser offers more than other browsers even come close to offering. This browser currently enjoys a 4 star rating on the App store, that is pretty much what I would give it if I took the browser at surface value, but when you scratch below the surface, its extra offerings will definitely bump it up another half. The best part is that it only costs $1.99 – sure, there are free browsers, but they don’t come close to iCab Mobile. Note: iCab is a universal app and works on your iPhone as well. 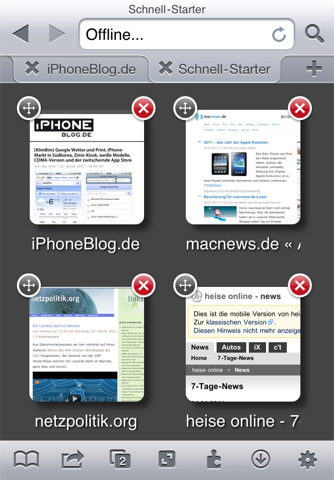 Here’ s screenshot of how iCab browser looks on the iPhone screen. 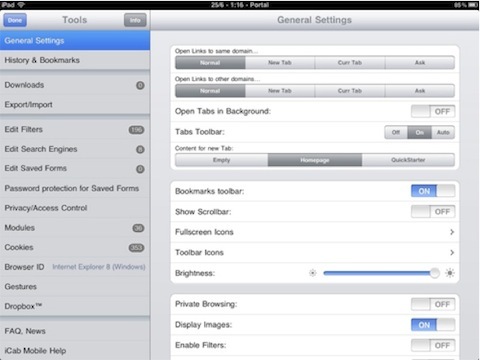 AppSafari review of iCab Mobile (Web Browser) was written by Richard Best on June 26th, 2011 and categorized under App Store, iPad apps, Net, Universal, Utilities. Page viewed 6891 times, 1 so far today. Need help on using these apps? Please read the Help Page.